FTE Engineering has the capacity to weld or fabricate many different projects that you may require; from welding small brackets, frames and plates to fabrication work on semi -trailers, trucks and everything in between. Over the past 25 years FTE Engineering has completed many varied fabrication projects. Big or small, these have been undertaken with the same amount of enthusiasm and skill. 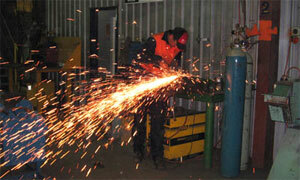 We provide specialty welding and fabrication with strong experience in aluminium and stainless steel. FTE Engineering is also a licensed Vehicle Modifier and has completed many truck fabrication projects. This workshop is equipped with press brakes, guillotines, metal workers, bandsaw up to 900mm a plasma cutter catering for 3m to 7.5 m plates welders including submerged arc with associated rotators and manipulators. Radial arm drilling machine metal workers of various sizes. So as FTE Engineering can assist you in every possible way, it is advisable for you to provide us with a written guideline and or drawing of your project, from this we can provide a quotation and develop your design to suit, alternatively you can come down to our workshop and discuss your project with one of our experienced trades personnel. If you require further information on FTE Engineering\'s Welding Fabrication services, please do not hesitate to contact our Administrations Office on (08) 9754 4777 or use our website contact form.